Do you hate being the office drone? Has recession robbed you your job? Are you teeming with ideas you know others will pay for if only they were available? Are you always thinking of how an establishment can better their services and products? 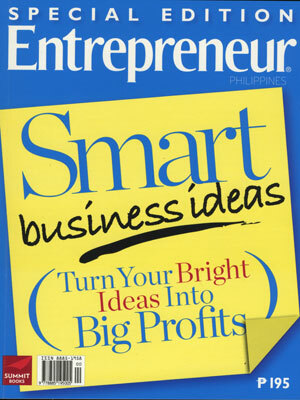 If you answered yes to at least one of them, then Entrepreneur’s Smart Business Ideas book may just do wonders for you. It has over 60 business stories that cover a wide variety of industries, a wide range of budget, and an assortment of work. From running errands for other people to e-burol to providing public storage, these are stories from which you can learn and draw motivation. Among our favorites are those with super small capitals like the online delicatessen shop, making your own cult shoes, and producing bags from foil packs (which will only cost you a measly P300!). There are stories that are more aspirational than practical—bottled green tea is not something a budding entrepreneur can start with, we know—but the feasible ones far outnumber such stories. For more business ideas, check out Entrepreneur!